Male lesser bird of paradise Paradisaea minor, photographed by Leo Antonius. 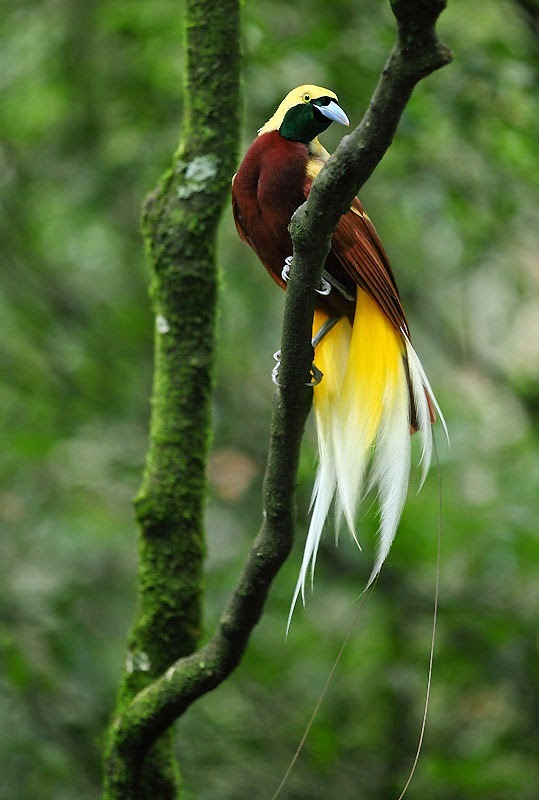 The Paradisaeidae, birds of paradise, are a group of stout-billed birds found in northern Australasia. Males of this family are often extremely colourful and/or ornately plumed, and may perfom complex mating displays. [F95] Fuller, E. 1995. The Lost Birds of Paradise. Swan Hill Press: Shrewsbury (UK). [G66] Gould, J. 1866. Exhibition of the trachea of Manucodia gouldi. Proceedings of the Zoological Society of London 1866: 201. [T62] Tendeiro, J. 1962. Estudos sobre malófagos: Revisão monográfica do género Columbicola Ewing (Ischnocera, Philopteridae). Memórias da Junta de Investigações do Ultramar, ser. 2, 32: 7-460.